We are back on! Jamie came up last night and fastened the ground wire to the chassis and low and behold..the stairs worked. They are a bit wonky again today, maybe the wire loosened, but I don't care. We are back onto the count down. Roger's on the phone now with Cummins South in Orlando getting an appointment for our work to be done. They told him that they have a campground there and they will hook us up since it may take a few days to get everything done. I'm excited! So it started that we took all three kids to the vets for their shots! That's Dr. Mike and his assistant Liz. 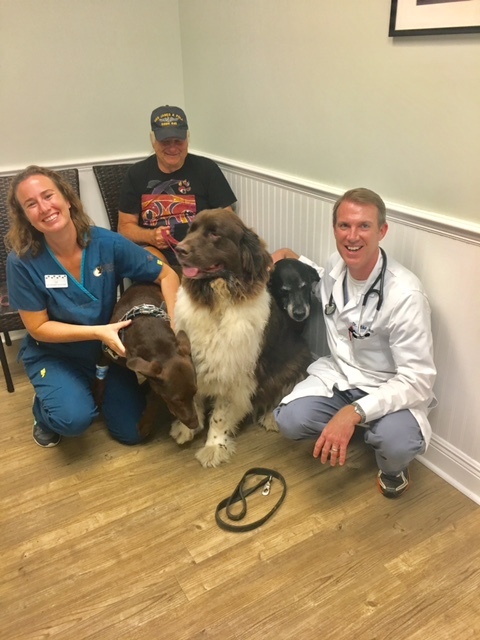 We have been going to Dr. Mike since we had Sophie and Fergus and Sammy was a pup. He got me through Sammy's emergency surgery after eating a corn cob, (They aren't digestible) , then through Fergus brain tumor and finally Sophie's Melanoma in her gums. 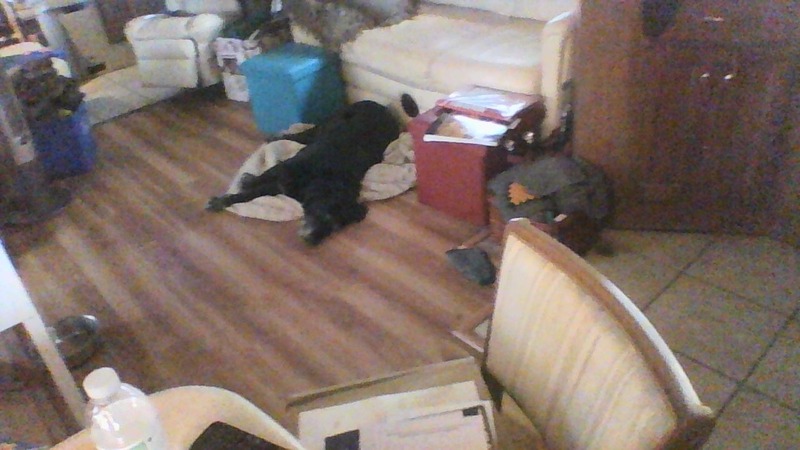 Bless him, he's seen me laying on the office floor cuddling Fergus, crying with Sam and sobbing with Sophie. Best Vet ever!! Next thing on my to do list, wash and wax the coach! You spray the cleaner on one side of the holder then with the opposite side you dry. As you can see the sides are clean and shiny! And you can also see we have our wheel covers off!! Getting serious. When I came in Ozzie came right up and told me I did a great job!! It's already massively hot here in Florida. It seems to get hotter earlier every year. I must say the humidity is great for ones skin but from all the moisture pouring from every pore, one looks like hell! And the rain has started! I can hear thunder in the distance so I am going to do what our Sammy is doing right now! Take a nap! We started about 9:30 A.M. and stopped a bit ago. Washed wheel covers, checked stairs, washed and waxed the back of the coach, stored more things and did laundry. I need to paint but for right now that comfy mattress is calling me and Sam can join me! So have a great night and I'll see you tomorrow with more of the count down. And yes, I am feeling sadness. Leaving friends, family,,but thankfully with internet they are not far away.